By Dr. Tracy McFarland, a veterinarian and writer for Pets Best Pet Health Insurance, a cat health insurance agency. Feline periodontal disease is not unlike periodontitis in humans. Plaque from bacteria hardens into tartar and leads to inflamed gums. This tartar in turn causes gingivitis and eventually the loss of bone and gum tissue around the cat’s teeth (periodontitis). While not entirely understood, tooth resorption causes painful lesions that eventually break down the teeth. Both dental diseases can be extremely painful for cats and will likely require cleaning and extractions of the diseased teeth. While treatment requires a fairly serious medical procedure, prevention is simple and straight-forward. The easiest way to prevent dental disease in your cat is to regularly brush your cat’s teeth. Make sure to use a pet safe toothbrush and toothpaste, never use human toothpaste as it may contain toxic xylitol. Regular veterinary check ups and vet approved dental chews are also effective preventative measures. To ensure you are an informed advocate of your kitty make sure you understand your vet’s treatment recommendation. Here are three questions you should ask your veterinarian before your cat undergoes a dental procedure. Why does my cat need a dental procedure? 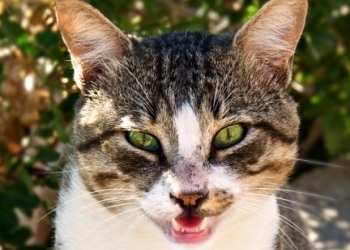 Ask to see your cat’s teeth, including tartar, gingivitis or visible feline resorptive lesions. Not every problem is obvious when your cat is awake, but unless your cat has a serious “cattititude”, you should be able to see why a dental procedure is needed. A majority of cats have the beginnings of dental disease by three years of age. You may already have a suspicion, based on your cat’s bad breath, red gums or difficulty chewing. Dental disease left unattended can lead to more serious problems, including heart, kidney or liver disease. This is caused by bacteria from your cat’s mouth entering and traveling in his or her bloodstream to these vital organs. Looking for dental disease is an important reason why an annual preventative wellness exam is so important. Indoor cats get dental disease too! Is my cat healthy enough for a dental procedure? Anesthesia is required for a thorough oral exam, intra-oral dental radiographs (x-rays), sub-gingival scaling, cleaning, polishing and any necessary extractions. Most cats can safely undergo the general anesthesia but your veterinarian should perform a complete physical exam, and ideally, pre-anesthetic laboratory tests, to ensure that he or she has all the information necessary to select an appropriate anesthetic protocol. Pain management must also be considered. Does my veterinarian have the equipment and expertise to provide a true standard of care dental procedure for my cat? Your veterinarian’s team will need the ability to place an intravenous catheter to deliver fluids and anesthetic drugs, and an endotracheal tube, to guard your cat’s airways and deliver gas anesthesia. All dental instruments should be cleaned and disinfected by autoclave. Your cat should also have intra-oral x-rays taken to look for the hidden dental problems, such as resorbing roots. Feline resorption lesions destroy enamel and expose sensitive dentin. Your veterinarian should be able to perform local nerve blocks to reduce the amount of gas anesthesia needed and enhance patient comfort post-dental. They will need power dental drills to facilitate extractions and perform crown amputations (removal of the crown only). This is necessary when a tooth’s roots have resorbed into bone and the crown must be removed. Any extraction or crown removal sites should be closed with sutures(stitches) to speed healing. Lastly, your cat should receive safe, effective pain medication if any extractions or crown removals are performed. A registered veterinary technician can perform simple, non- surgical extractions (such as loose teeth), under the supervision of a veterinarian but only a veterinarian should perform difficult extractions. As you can see a cat’s dental procedure requires a team of professionals and advanced equipment to do the job right. Please ask your veterinarian these important questions.